Nathan Barontini's Blog: Why it Doesn't Make Sense to Define Atheism as "Lack of Belief"
Why it Doesn't Make Sense to Define Atheism as "Lack of Belief"
Recently, thanks primarily to my post Does Lack of Evidence Justify Atheism (spoiler alert: it doesn’t), I’ve encountered many atheists who insist that I’m simply using the term “atheist” wrong. Atheism, according to these wags, doesn’t say God doesn’t exist, it is merely the “lack of belief” in God. This is a surprisingly common atheist refrain, so I thought it might be worth examining a bit closer here on the blog. The most straightforward, and most common, differentiation between positions on the existence of God is based on the various different answers to a very simple and straightforward question, Does God exist? Group 4 - Weak Agnosticism (the ignorant) - God may or may not exist. Group 1 (theists) answer the question Does God exist by saying “yes.” Group 2 (atheists) answer the same question “no.” Groups 3 and 4 answer our question by saying “I don’t know,” but differ on whether or not they think anyone can possibly know the answer. This last group is the weakest as it makes no real claim about anything outside their own heads. They say nothing about objective reality preferring to only comment on their own knowledge (or lack thereof). The proper agnostic at least affirms the unknowability of whether or not God exists, and thus can still be argued with. The “weak agnostic” however will not even go so far. This makes this last group not only the weakest, but also, by far, the least important. They are simply ignorant on the issue. Someone from one of the first three groups can seek to enlighten them, but no one can argue with them as they have nothing to bring to the argument except ignorance. Imagine, if you will a group of mathematicians. The first man says the square of the hypotenuse equals that of the two sides. A second man denies this, claiming the math is simply wrong. A third man claims we can have no rule that will always work for all triangles. These three men can have a conversation and even eventually work toward a solution to the disagreement. Now imagine a fourth man enters the scene who simply says “I dunno”. Is there any meaningful part in the conversation he can play other than being taught by one or all of the other men? In the same way we have three different positions that can have an active role in answering “the God question” while those claiming ignorance on the issue are best left to study the arguments and move into one of the other three camps. You probably see the first problem with this proposed system immediately. It has taken the least important group (the ignorant) and made two groups of them, giving them a weight they simply don’t warrant. We’ve also lost an entire group (“agnostics”) with the redivision leading to yet greater unclarity. Where are the people who claim not only that we don’t happen to know whether God exists, but that we can’t know? The new system has not only lost this entire group, but has even appropriated their rightful name as a (more or less useless) adjective. If we pose our simple, straightforward question, does God exist, to these four new groups we get a simple “yes” from group one and “no” from group 3, while getting no answer at all from the remaining two groups. Group 2 answers, “I dunno, but I have a belief in God.” Group 3, “I dunno, but I lack belief.” Why anyone feels it necessary to add on an answer to an entirely unasked question about they belief/ lack of belief in God is quite beyond me. 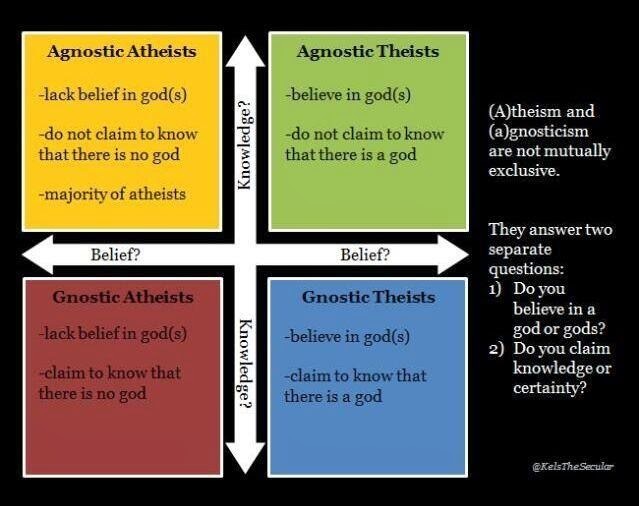 It is interesting to note that, supposedly, most atheists (or “most intelligent/ educated atheists”) are in group 4, that is they are really agnostics who happen to (mis)identify as atheists rather than being atheists in the full and proper sense of the term as most people use it. As we can see this division is straightforward and provides clarity. Those in the first three groups can be asked to present evidence to back up the claims they make about the universe, while the last group can only be persuaded by one of the first three to join their ranks, they are “on the fence” but are not committed to staying there. Now let’s see how the new system proposed by many internet atheists would work. I think it is immediately obvious that this second system is significantly inferior to the first. If I ask someone “does life exist outside the planet Earth?” I’m not asking anything about their subjective belief (or lack thereof), I’m asking a question about objective reality. That is to say, I’m not asking about what is or isn’t in their head, but about what is or isn’t in the universe. This holds true for theism/atheism as well and means there is no justifiable reason to split the agnostics into "agnostic theists" and "agnostic atheists." Better to leave the whole group together under the clear label "agnostic." We might wonder why atheists then don’t just call themselves “agnostics” (most atheists are “agnostic atheists” as I've been repeatedly told). It certainly isn’t for the sake of clarity. No one, upon hearing someone declare themselves to be agnostic, follows up with “so do you believe in God?” The question is already answered, no, but they don’t claim to know He doesn’t exist. In fact, I think the atheist would be hard pressed to find more than a small handful of “agnostics” who would also claim to believe in God, to be “agnostic theists.” So what’s the deal? In almost all cases where I’ve run into hostility in using the term atheism to mean “the denial of the existence of God” it is by atheists who are desperate to shift the burden of proof entirely onto theism. They know they can’t actually justify their worldview with any arguments or evidence (unlike theism) so they resort to the cloudy division above to avoid having to. The problem with this, though, is that it makes them very hypocritical. Atheists are among the first to attack theists for believing in God without being able to prove their worldview (we can, but let that slide) while simultaneously believing in atheism without being able to prove their worldview (they can’t, but they assure us that it’s okay). I'll suggest that it would be less convoluted and more honest to simply identify as agnostic and leave it at that. At least, if honestly and clarity were paramount, we'd expect atheists committed to the "new system" to self describe as either "agnostic atheists" or "gnostic atheists" rather than just as "atheists." In my experience, this rarely occurs unless the atheist is specifically prodded on the question. Is Theism Just a Lack of Belief Too? Another way of looking at the absurdity of trying to change the definition of atheism to merely mean "lack of belief in God" is to apply the same logic to theism. Just as the atheist can try to evade the burden of proof by claiming he simply lacks a belief and no one needs to have a reason to lack a belief in something, so too the theist can play the same game. 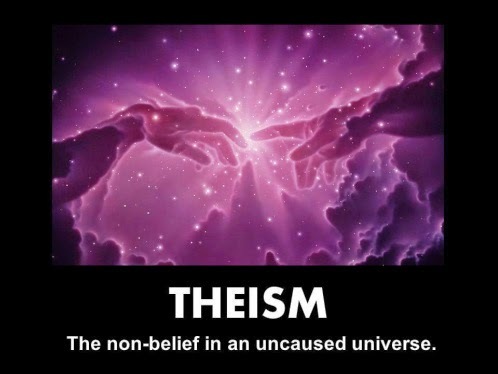 Would any atheist be content with the semantic trick of defining theism as a "lack of belief in an uncaused universe?" Logically, any affirmative statement can be redefined as the "lack of belief" in it's contradictory. For example, geocentrism could be redefined from "the Earth is in the center of the solar system" to "a lack of belief that something other than the Earth is in the center of the solar system" and Holocaust deniers could reword their claims from "there was no Holocaust" to instead be merely "the lack of belief in the Holocaust." In fact, anything can be just a "lack of belief" in something. Should we then not demand evidence and argument from anyone for believing in anything? Worse still, the new system would "draft" all kinds of people, and things, into the atheist camp: babies, dogs, cats, trees, flowers, and rocks would all suddenly qualify as "atheists" as they all "lack a belief in God." Of course, they would also all qualify as "theists" if we adopt the definition "a lack of belief in an uncaused universe" and they would also all be Holocaust deniers, geocentrists, etc. What advantage it would be to claim people (or plants, animals, or things) who have never considered the question to be in your "camp" is a mystery to me. The new definition of atheism also undermines atheism itself. Why would an increase in the number of "atheists" be something to celebrate when it only represents the increase of ignorance? Thus, I use, have used, and will continue to use the word “atheism” to designate the worldview that claims God doesn’t exist and “agnosticism” for the worldview that claims not to know whether or not God exists. Atheists are free, of course, to use the term in another way, but without any good reason to adopt the less precise system they propose, I will continue to use the more common, more accurate, traditional system. 1. According to the Online Entomology Dictionary: atheist (n.) 1570s, from the French athéiste (16c. ), from Greek atheos "without god, denying the gods; abandoned of the gods; godless, ungodly," from a- "without" + theos "a god"
2. According to the Online Entomology Dictionary: agnostic (n.) 1870, "one who professes that the existence of a First Cause and the essential nature of things are not and cannot be know" [Klein]; coined by T.H. Huxley (1825-1895), supposedly in September 1869, from Greek agnostos "unknown, unknowable," from a- "not" + gnostos "(to be) known." 3. Another misused term in the new system is "gnostic." The gnostics were not simply anyone who happened to claim to "know" something about God. Rather they were an earlier Christian heretical sect that claim special knowledge about God that was unavailable to other believers. 4. As ET life is primarily a question that needs solved by induction (unlike the God question which must be approached deductively) and as we have the capabilities to explore only a small portion of the universe, group four is where most of us ought to find ourselves. "Lack of belief" can describe both atheism and agnosticism and thus fails to provide a good definition. Further, if atheism solely describes subjective personal states of belief (or lack thereof) and if it contains no objective truth claims, then it is entirely unimportant and unarguable. Someone says "I'm an atheist" (meaning not, "I am advancing a truth claim that the real word is godless" but only "I personally lack belief in any God or gods"). The only response is, "Okay. I'm sure you know whether or not you believe in God, but honestly, who cares?" Group 4 - Weak Agnosticism (the ignorant) - God may or may not exist." Where's "probably", "probably not" "depends which god you're talking about" etc? "This last group is the weakest as it makes no real claim about anything outside their own heads." So do you hypocrite. You can't say for a fact if God exists, you can only say if you believe in God. "They are simply ignorant on the issue." NO ONE knows for a fact if Jehovah is real! You can be pretty sure or doubt it, though. "In the same way we have three different positions that can have an active role in answering “the God question” while those claiming ignorance on the issue are best left to study the arguments and move into one of the other three camps." So... basically, you're trying to shame people for being open-minded. I prefer NOT to be defined by something I DO NOT participate in or have affiliation with. If you are a smoker and I don't smoke, don't call me a non-smoker. If you drink Dr Pepper and I don't, don't call me a non-Dr Pepper drinker. If you are a theist and I don't believe in any religion, don't call me an atheist or non-theist or non-believer. Don't wrap me up in any of this nonsense. I don't need any of those labels to exist. Just call me Steve.